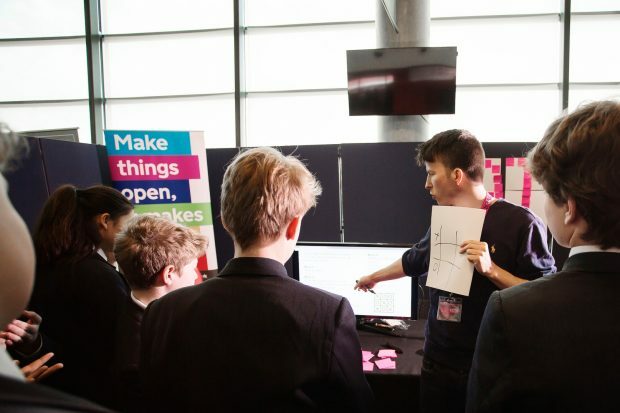 I'm a data scientist at the Government Digital Service (GDS) and last month I got the chance to represent both GDS and the Data Science community at TeenTech City 2018 - an event showcasing tech and science careers - at the Emirates Stadium. Despite 2018 being Arsène Wenger’s worst season in charge of Arsenal, there was certainly no lack of enthusiasm amongst the 540 Year 8 and 9 students from 50 schools at the event. At the start of our session, I asked them if they could define Artificial Intelligence (AI). The answers I got back were vague and pointed at technologies such as “robots and things” or Alexa. After speaking with me and my GDS colleagues Ellie King and Nicky Zachariou, and playing some AI games, you will see how their answers differed by the end. TeenTech is a not-for-profit organisation that helps young people understand the opportunities in the science, technology, engineering and maths (STEM) industries, irrespective of their gender or social background. 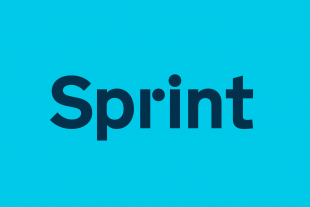 At GDS we are home to the Digital, Data and Technology Profession, which ensures government has the people and skills it needs now and in the future. We pride ourselves on diversity and inclusion so we were delighted to be invited to deliver a workshop. 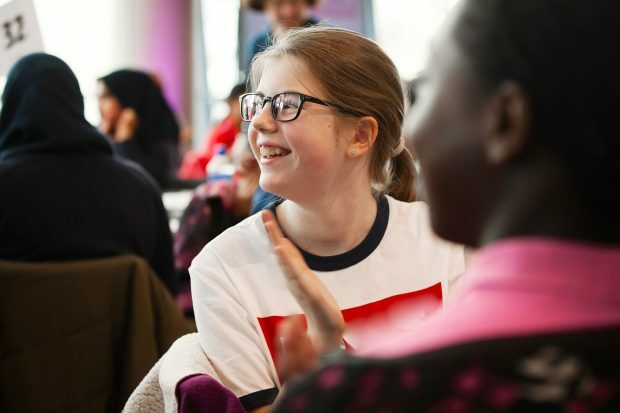 TeenTech City aims to be a positive, hands-on-day led by industry, with challenges and experiments helping them understand the wide range of opportunities in STEM. I’d previously taught at a secondary school on the TeachFirst graduate scheme, and I felt at home in front of students again, filling them with wonder at how awesome AI is. Like all good lessons, we started with something to grab their attention. Pictionary. This wasn’t a regular game, where you normally drawing a crooked horse, only for a family member to insist it’s a badger - instead students were playing with Google’s Quick Draw, an AI that has been trained on a large labelled doodling dataset. Students were split into two teams and asked to draw from a pre-selected list of items. The challenge was for the AI to correctly guess what the item was - and as fast as possible. The students were super enthusiastic for the game and as I saw their excitement, I reflected at how when I was at school the internet was not yet mainstream. AI will impact the lives and careers of these children in much the same way as the internet has shaped mine. After playing the game we used the thumbs-up-thumbs-down signal to formatively assess prior knowledge of AI applications. This revealed that most students had only considered humanoid versions of AI, such as virtual assistants and androids. This familiarity bodes well for GOV.UK’s recent development with Alexa. To continue the debate we also asked the students what they thought the nature of AI was. We found these philosophical questions sometimes engaged the students more and led to spirited discussions amongst my fellow data scientists. The main part of the session was drawing the distinction between problem solving with traditional programming compared to using AI. How best to teach that than by playing a game with an intelligent piece of paper, of course. The intelligent piece of paper is a game that introduces an algorithm that never loses at noughts-and-crosses. It prompts a discussion on what it means for a machine to be intelligent. I set the scene for my students with my story of a legendary piece of paper that I found washed up on a beach, half-covered in sand and plastic. I waxed lyrical about how intelligent this piece of paper is. Clearly incensed that I would suggest the paper was smarter than them, they were up for the challenge to beat it. They promptly lost a game of noughts-and-crosses against the intelligent piece of paper (52 Wins, 0 Losses, 8 Draws). While playing the game, each pair had to work together to follow simple computer code and consider how knowledge can be enshrined in it. We contrasted this recipe-like approach to the learning process involved with AI; whether learning from data, like our Pictionary example, or learning from rewards like a dog. Students reflected on the specific intelligence capabilities of AI by watching it beat computer games. What did the students learn about AI? After the session, we asked the students again what AI meant? See if you can spot the differences between the answers given before our session and after. Artificial intelligence is a human-made system that learns from input or rewards from its environment. A system which is programmed to move or do something by repetition and rewards of digital dog biscuits. An artificial mind that can learn by itself after being given a simple incentive or objective with feedback as how it’s doing. AI does the boring jobs leaving us with more time to play football. AI is like a machine’s brain. Like a baby, you help it to learn by giving it a lot of data. If the computer hears you answer a lot of questions or play games, later it can do these things also. But it only knows what you show it and tell it, so it’s not as smart as you are. As my job involves automating government statistics production, I’m keen to leverage technology, including AI, to improve efficiency across Government and wider society. Hopefully the students who joined us at the event will go on to have careers making that dream a reality. Follow Mat on Twitter and don't forget to sign up for email alerts. GDS recently hosted a TeenTech’s Teacher event in partnership with Department for Digital, Culture, Media and Sport. If you work in government you can apply to the Data Science Accelerator programme until 12 June. GDS is currently piloting an Emerging Technology Development programme - contact etdp@digital.cabinet-office.gov.uk for more information. Thanks Jenny, that sounds awesome, just wish I had a chance to have a go at your challenge! Maybe next time. 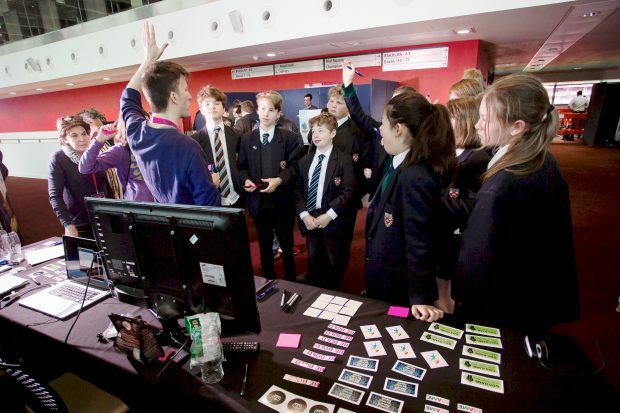 My company also took part in TeenTech City; we worked with students to program Lego Mindstorm robots to navigate a simplified version of the TfL tube map. The robots had a light sensor built into the bottom of the chassis which we used to make the robots follow a coloured line between tube stations. The robots were programmed using blocks of code similar to Scratch and the exercises introduced the ideas of loops and conditional statements. There are loads of possibilities for running workshops, so I would add to Mat's enthusiasm and encourage anyone thinking of getting involved with days like these to go for it!